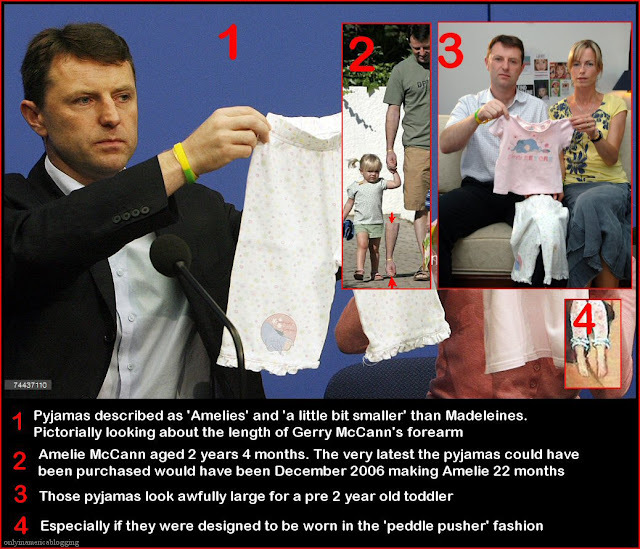 Who took the McCanns' 'official photograph' of Madeleine's pyjamas? The image in question was 'released' to the world's media in the late afternoon of 10 May, 2007, following a press conference that day. It was no doubt assumed by many that, since the PJ released the photographs (there is more than one), the PJ themselves must have taken them. Yet a film distributor who arranges the release of a 'blockbuster' is hardly likely to have spent the previous months/years actually doing the filming. With this seed of doubt in mind, one might consider what the PJ did with their photograph(s), adhering all the while to the worldwide practice, among law enforcement agencies, of 'continuity', whereby the progress of evidence through the system, in whichever direction, is recorded at each step along the way. Whereabouts, then, did they file this particular 'diligence' of theirs? A far cry from earlier publicised representations you will admit. Why on earth should the PJ have seemingly undertaken the same photographic work twice, involving two quite different sets of pyjamas? The forensic record (of garments correctly pictured alongside a scaling reference, i.e. a ruler) is that of a pair of pyjamas supplied on request by M&S (UK), afterwards forwarded to the Forensic Laboratory in Lisbon by Goncalo Amaral, together with a covering letter dated 7 June. It has nothing whatever to do with the official photograph released in early May. In fact the clothing pictured has more in common with that featured in the retailer's own contemporary stock photograph, a copy of which was sent to the Algarve Resident, again on request, and which the 'Resident' published on 8 May - two days before the official release. 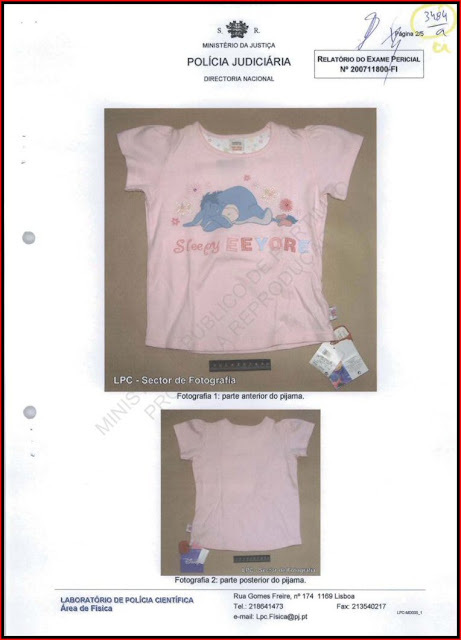 During a press call at the Amsterdam Hilton, on 7 June, Kate McCann took pains to explain that the pyjamas being exhibited at that time were in fact Amelie's, and that Madeleine's were not only bigger but did not feature a button-fastening t-shirt. Only a couple of days earlier the same pyjamas, again described as 'Amelies' and 'a little bit smaller', were presented on 'Crimewatch', but without reference to the button discrepancy. 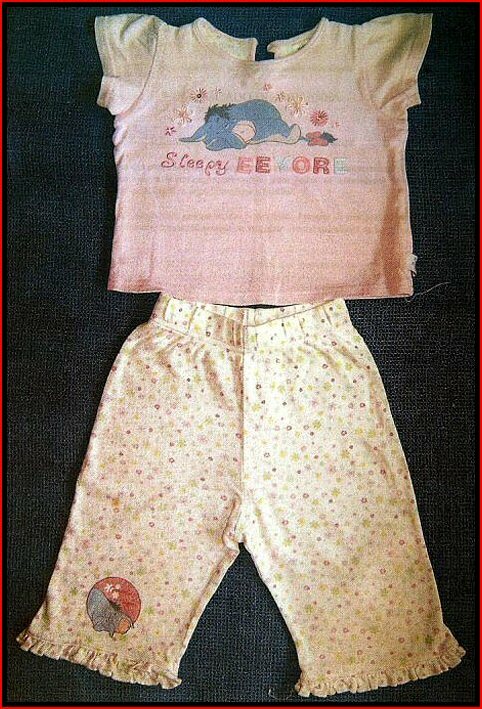 It stands to reason of course, that, Madeleine McCann's pyjamas having been abducted, a surrogate pair would have been required for photographic purposes, in the event of there being no extant photographic record of the clothing in question. But appropriate photographs were to hand. They already existed. One version, as we have seen, was published by the Algarve Resident, another by the BBC. The McCanns' 'official' version was consistent with neither of these. With the PJ yet to physically access a representative set of pyjamas, why should they have been called upon to photograph anything else for immediate release? There is no record of their having done so. Ergo they did not. So who did? And where did the pyjamas come from that enabled them to do it? Addressing the second of these questions first, the garments featured in the PJ release cannot have come from M&S locally, since all their Portuguese branches had been closed years before. Had they come from M&S in the UK they would obviously have resembled the pair sent to (and genuinely photographed by) the PJ. 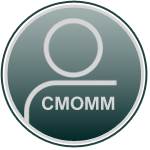 A pointer to their origin is, however, to be found within the case files. Alongside a suite of photographs taken at Lagos Marina by Kate McCann is an introductory memo, written by DC Markley of Leicester Police on or about the 8 May and headed up, 'Information from the Family'. 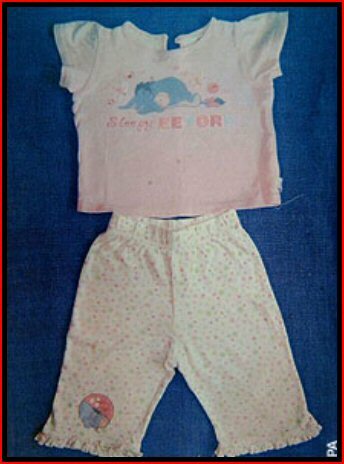 Here also one finds the only copy (in black and white) of the McCanns' official photograph of Madeleine's pyjamas (Outros Apensos Vol. II - Apenso VIII, p.342). Rather than its being a PJ production, afterwards passed to the McCanns, it seems the photograph was actually a McCann production fed to the PJ, an observation wholly concordant with the fact that it was actually the McCanns who first revealed this photograph to the press, on Monday 7 May, three days before the PJ released it (as reported by Ian Herbert, the Independent, 11.5.07). Any illusion that the image in question was the result of a McCann representative's commissioning their own studio photograph of 'off-the-shelf' UK merchandise may soon be dispelled. It is an amateur snapshot. Taken in ambient (day) light, against a coloured (as opposed to neutral) background, it is slightly out of focus and displays detectable signs of parallax. It is not something even a journeyman professional would admit to. And yet, bold as brass, it represents 'information from the family'. 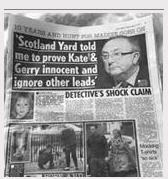 On Kate McCann's own admission, to a House of Commons committee no less, neither she nor husband Gerry were any more capable of keeping cool under fire during this time. Having earlier (August 2007) told her Pal, Jon Corner, "the first few days.…you have total physical shutdown", she went on to advise the House that, despite being medically trained, she and her husband "couldn't function" (John Bingham, the Telegraph, 13.6.2011). Well someone on the McCann side of the fence managed to function in time for the parents to appear before the media on 7 May with a photograph that, so far, no-one seems to have taken, and of clothing which, other things being equal, ought not even to have existed anywhere inside Portugal, except, perhaps, in the clutches of a fugitive abductor. But, of course, other things are anything but equal. A month after the world's media were first shown a picture of something resembling Madeleine McCann's 'Eeyore pyjamas', a real set was being touted around Europe. Described by Kate McCann as 'Amelie's' and being 'a little bit smaller', they were held aloft for the assembled press brigade, without any one of them questioning the pyjamas' origins either. Being 'Amelie's' was quite enough, apparently, to justify their also being in the McCanns' possession at the time. Since when though? Gerry McCann did not return home to Leicester from Praia da Luz until 21 May, time enough for him to have raided his daughter's wardrobe for something he might need on his European travels, but way too late to have met any 7/10 May deadlines. It seems, then, as if the two ingredients required to achieve an earlier photograph of 'Madeleine's' pyjamas (the photographer and the subject) were both missing. So how was it done? What at first appears to be a riddle is soon solved when one realises that the pair of pyjamas which accompanied the McCanns around Europe was the very same pair that starred in their 'official photograph' taken earlier. Kate McCann took public ownership of them before the television cameras the moment she referred to them as 'Amelie's'. On close inspection these pyjamas (Amelie's) are revealed as identical to the pair previously pictured in both the Daily Mail (10.5.07) and the Telegraph (see top of page here), down to the stray threads dangling from both upper and lower garments. This means that 'Amelie's pyjamas', for want of a better description, were also present with the McCanns since the start of their Algarve holiday. Suddenly the question ceases to be 'Who photographed a representative pair of Eeyore pyjamas?' and becomes, instead, 'Who photographed Amelie's pyjamas?' Furthermore, if everyone was feeling so shell-shocked as to render them incapable from the Friday, when did they have the presence of mind to take the requisite pictures? We begin to edge toward a sinister conclusion once we take particular account of the literal background against which these particular pyjamas were photographed. Unlike the various studio renditions of Eeyore pyjamas to which we have been introduced, the McCann's official photograph(s), versions of which were published by both the PJ and the UK media, present the subject laid out against a blue textile, rather than the more customary piece of artist's board. This blue upholstery, for that is unquestionably what it is, helps define who, among the Tapas 9, might have been the photographer. The Paynes, the Oldfields and the O'Briens can be ruled out. Only the Payne's apartment incorporated any soft furnishings in blue, but of a different quality to the plain open-weave material on display here. During the early morning of Friday 4 May, 2007, the McCanns were re-located to alternative accommodation in apartment 4G - another in which blue soft furnishings were conspicuous by their absence (it was appointed in beige throughout). * Added to which the concern, lest we forget, is with photography involving a pair of pyjamas known to have been in the McCanns' possession from the outset. apart from the personal photos already delivered by him to the police authorities after the disappearance of his daughter MADELEINE, he has no others in his possession. "I haven't been able to use the camera since I took that last photograph of her" (The Telegraph, May 27, 2007). That statement alone carries with it a very serious connotation. However, we still have a distance to travel. The more contrastive of the two images reproduced here displays what appear to be areas of shadow, when in fact there are no local perturbations at the surface of the fabric to cause them. Similarly, the dark bands traversing the t-shirt appear more representative of what is actually beneath it. These visible oddities suggest the material is in fact damp and 'clinging' to the underlying upholstery. "I returned to our apartment before Gerry had finished his tennis lesson and washed and hung out Madeleine’s pyjama top on the veranda." As previously stated, Kate McCann was careful to bring the attention of her Amsterdam Hilton audience, to Madeleine's pyjama top being both larger and simpler than the version she was holding in her hands at the time. She was inviting them instinctively to associate garment size with complexity - the larger the simpler in this instance. It would mean of course that Madeleine's 'Eeyore' pyjamas, purchased in 2006, would not have been absolutely identical with those of her sister Amelie, purchased whenever (but obviously before the family's 2007 holiday on the Portuguese Algarve). "The McCann family also disclosed that on the night of her disappearance Madeleine was wearing white pyjama bottoms with a small floral design and a short-sleeved pink top with a picture of Eeyore with the word Eeyore written in capital letters. "The clothes were bought at Marks and Spencer last year." "The Pyjamas are from Marks and Spencers, size 2 to 3 years -97 cm. "The pyjamas are composed of two pieces: camisole type without buttons"
Since these items could only have been supplied to the PJ in mid-07, they must have represented that year's style, as it were, for 2-3 year olds. Madeleine would have been four years old by this time. However, Kate McCann would have people believe that 'Amelie's' pyjamas, sporting a button, were designed to fit an even younger child. Had Kate purchased the appropriate pyjamas for Amelie in 2007 of course, they would not have had a button at all. They must therefore have been purchased in the same epoch as Madeleine’s own, i.e. during 2006, when Amelie would have been a year younger and somewhat smaller even than when the family eventually travelled to Portugal the following year. The significance of all this becomes apparent once we consider those photographs which show how the pyjamas held aloft by the McCanns at their various European venues encompassed half Gerry McCann's body length at least. Photographs of the McCanns out walking with their twins in Praia da Luz, on the other hand, illustrate, just as clearly, that Amelie McCann did not stand that tall from head to toe. Even In 2007 she would have been swamped by her own pyjamas, never mind the year before when they were purchased. In conclusion, the McCanns' 'official photograph', first exhibited on 7 May, appears to be that of a damp pair of pyjamas, too big to have been sensibly purchased for Madeleine's younger sister that Spring, and most certainly not the year before. The subject is set against dark blue upholstery of a type not present in any of the apartments occupied by the McCanns or their Tapas associates immediately after 3 May. Kate McCann has explained, over time, how she was alone in apartment 5A that morning, in the company of a damp pyjama top (having just washed it) and how, from that afternoon by all accounts, she 'couldn't bear to use the camera', an automatic device (Canon PowerShot A620) belonging to a product lineage with an unfortunate reputation for random focussing errors. Madeleine was not reported missing until close to 10.00 p.m. that night. If Madeleine McCann's pyjamas were not in fact abducted, then nor was Madeleine McCann. Grateful thanks are due to Nigel Moore for collating a number of highly relevant photographs and media reports in connection with this topic. 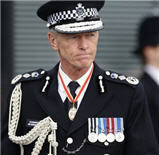 If a fellow thought that the Metropolitan Police Service was a functioning entity, he might call for the arrest of the McCanns based on what is written and depicted here. Ed. Another brilliant forensic analysis produced from the collaborative efforts of Dr Martin Roberts with Nigel Moore, thanks for posting, GGS. Everyone concerned with Madeleine's disappearance, including DCI Nicola Wall, should read, mark, learn and inwardly digest the astounding contents of this article. I am totally confused by it to be honest. Can someone explain it concisely for me. Thanks in advance. The inference is that the pyjamas represented as Amelie's were in fact Maddie's, which would mean that she wasn't wearing them, which would mean she's no longer with us. April28th wrote: The inference is that the pyjamas represented as Amelie's were in fact Maddie's, which would mean that she wasn't wearing them, which would mean she's no longer with us. Thanks. Yes, I understood that was the inference but couldn't quite understand the explanation or at least I can in bits. The photograph of the pyjamas was taken against blue upholstery but whose? The sizing of the pyjamas not the right size but as a parent I always bought clothes especially pyjamas a size bigger so not getting the relevance. It's the who took the photos and when and where and when publicised that is obviously the issue but I will have another read at it later to try and piece it together. Hopefully I've provided a suggestion as to upholstery source. Buying in a bigger size, yes. But 12 months in advance? must have suited them to do so for specific reasons. 1. If they passed them off as Amelie's - it backed up the abduction fairy story - that Madeleine was taken in her PJs. Otherwise they would have had to burn them or get rid of them. Great observations by Dr Roberts .. and yes, does certainly resemble upholstery in Mc Cann apartment. Also, the garment does look damp and clingy..
Just as an observation, as a mother of four, I always found M&S sizing to be generous. What was Madeleine's height given as? The same pyjama top that Madeleine wore that had the 'tea stain' on it? The one Kate McCann washed. Jigsaw pieces are fitting together. melisande wrote: The same pyjama top that Madeleine wore that had the 'tea stain' on it? The one Kate McCann washed. Jigsaw pieces are fitting together. Yes. Basically in his article Dr Roberts claims to have solved the 'tea stain' riddle. If Roberts is right, out goes a death at 6 o'clock on 3rd May, and out goes 'Smithman' (or at the very least, it becomes irrelevant even for those who still think the Smiths actually saw anyone). The pyjama party has always been a bit of a enigma - especially the T-stained pyjama top that was hastily washed and hung out to dry on the morning/afternoon of 3rd May 2007 when Kate McCann may or may not have been preparing lunch, playing tennis, jogging, taking poolside photographs or whatever else. Why the emphasis on pyjamas anyway? 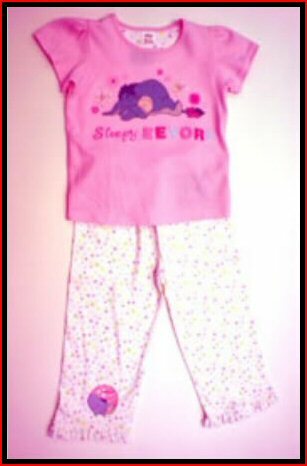 IF Madeleine (with a capital M) had been abducted as claimed by the McCann faction - would the abductor, or the next in the chain, have carried her around in her pyjamas? What did the McCanns hope to achieve by advertising the pyjamas Madeleine may or may not have been wearing at the time of her alleged disappearance? 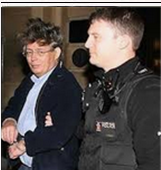 Following Kate McCann's alert at approximately 10:00 pm on 3rd May, a full scale search was conducted involving just about every adult in the vicinity (excluding the parents themselves and Jez Wilkins and partner) with zero result. Madeleine was therefore not located in night attire; do the parents truly believe their daughter could be identified hours/days/weeks later still wearing her pyjamas? This all appears to be designed around the Smith family allegedly witnessing a stranger - that didn't appear to be a tourist - carrying a pyjama clad child through the streets of PdL at around (coincidently? - that word again) the same time span as Kate McCann raised the alarm? ETA: Also Jane Tanner's alleged sighting of a man - that didn't appear to be a tourist - carrying a pyjama clad child through the streets of PdL. Neither of which have ever been identified as a reality. @Verdi wrote: The pyjama party has always been a bit of a enigma - especially the T-stained pyjama top that was hastily washed and hung out to dry on the morning/afternoon of 3rd May 2007 when Kate McCann may or may not have been preparing lunch, playing tennis, jogging, taking poolside photographs or whatever else. Snipped quote.......................Why the emphasis on pyjamas anyway? Because pyjamas make you think of bed, night time. So we are brainwashed into the story that Madeleine was taken from a bed,in pyjamas and at night time. Not one more cent from me. So "Maddies Jammies" then. As revealed by JC. Next questions.......Where is the last outfit ? Oh and did cadaver dog Eddie get a sniff ? The pyjama issue (and stain, which I'd never believed to be tea, as claimed) had been a struggle to make sense of. An incisive piece of work by Martin Roberts. @Grande Finale wrote: So "Maddies Jammies" then. As revealed by JC. Come on, give due credit to Amelie herself! Maybe a two-year-old has come up with one of the most important bits of forensic evidence in the whole case! I , like possibly many others, saw the McCanns holding up pyjamas and thinking ok just a pair of pyjamas which could have come from anywhere, not thinking any more deeply about them. Dr. Roberts has helped us to understand many points a lot clearer. I hope the lady Judge in the GA trial understood how the McCanns laid on their suffering with a large trowel. 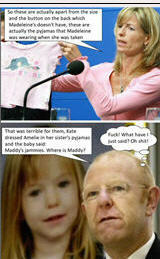 Unless I am mistaken, the McCanns gave a piece to cam on the next day, the Friday 4th May 2007, where they appealed for the return of Madeleine and Kate spoke in Portuguese/Spanish and I think holding a picture of Madeleine. Hardly someone that was non functioning. @whatsupdoc wrote: I , like possibly many others, saw the McCanns holding up pyjamas and thinking ok just a pair of pyjamas which could have come from anywhere, not thinking any more deeply about them. Dr. Roberts has helped us to understand many points a lot clearer. Somewhere at the back of my mind, don't I remember a comment 'Maddies jammies' from Amelie being, made when the said pyjamas were held up as her own... a smaller version supposedly. I have no chapter and verse for that. Does anyone else remember it? Is that a misremembering on my part? Uncle John said to the Sydney Morning Herald on 14th May 2007, "Kate dressed Amelie in her sister's pyjamas..."
(Found on Anna Andress blog, 20th May 2009). @Ladyinred wrote: Uncle John said to the Sydney Morning Herald on 15th May 2007, "Kate dressed Amelie in her sister's pyjamas..."
As the family waited fearfully for news, they faced the agonising reality of trying to explain to their toddler twins why their big sister was no longer there. "That was terrible for them," says John McCann, Mr McCann's elder brother, who has also travelled to Portugal to help search for his niece. But she is too young to understand. And how do you explain? All we know is that Madeleine needs..."
Did Amelie suss the whole situation better than anyone else? Was she really 'too young' to understand??? That's it! Two year olds are very proprietorial about such things as clothing. So if Kate dressed Amelie in Maddie's jammies (who wasn't called Maddie) then what was Maddie wearing? The peach top and broderie anglaise shorts, wrapped in a pink blanket and stuffed inside a blue bag? 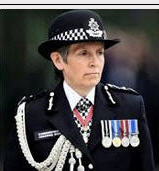 Was Maddie's Last Photo outfit given to the police or the sniffer dogs?